Hartford, CT: If you haven't realized after nearly a year and a half of reading about our trips, Roger and I don't really agree on what we like to do on vacation. Luckily, Connecticut has something for each of us - a writer's house and an art museum. With both Mark Twain's House and the Wadsworth Atheneum, and only two hours away, this seems like it was made for us. Charlestown, RI: My family used to rent a house here every summer, and some of my favorite memories take place on the beach and at restaurants in the area. There's not really anything here for Roger (who really doesn't like beaches, but does like lobster), but I believe he will come with me just because he loves me. Shelby says she will also come. Maybe we will camp on the beach! Or, spring for a fancy B&B! Storm King Art Center: Roger loves art and bicycling; I love Andy Goldsworthy and being outside. I still can't believe we've never made it up here. This summer, we will. Boston, Philadelphia, DC: Those fabulous, old-timey cities close by, where we have friends and where there is culture and fun to be had. We usually make it out to one of these places each summer, and Boston is next on our list. Any suggestions? New York, NY: Often, I end up hanging out in the city on Fridays, finding new and interesting things to do, from eating hot dogs at Coney Island to seeing gorillas at the Bronx Zoo to finding a million festivals and concerts and openings. That's what the first summer weekend will look like - tea at Alice's Tea Cup with Shelby, and several barbecues at home. Sounds like a good start to me! Do you have any summer plans yet? Do you feel a compulsive need to fit in as much as you can, or do you go with the flow? *I just made this docket up in my head. Please don't hold me to it. We're planning o going to the Great Escape this summer, and planning on getting back to NYC at some point. Other then that we don't have much planned yet. Except Montreal. There's always, and frequently Montreal. I am totally mourning the loss of summer, as my unemployed self is in that awkward spot between graduation and marriage. Even though my days have been reminiscent of summers in the past (sleeping in and no job! ), responsibility overshadows those carefree days....sigh! Sounds like you've got some fun trips planned! I can't wait until my soon-to-be husband and I can take some fun trips like that during the summer months. :-) We went to Philly last year over our spring break and found this fantastic place called Naked Chocolate...you HAVE to check it out if you haven't been there already. It's pretty much to die for. I'm super jealous of the Summer Fridays. I need to find a job like this. I'm jealous too! 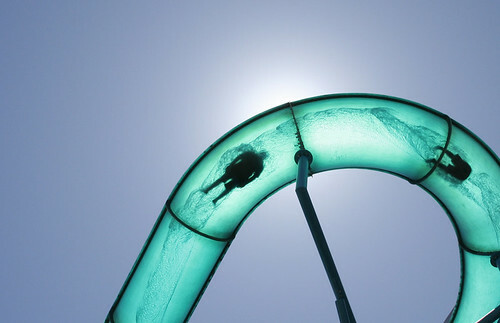 And also jealous of that water slide... I want to go there. My office is closed on Fridays during the summer, and it's pretty much the greatest thing ever (we have to make up the hours during the remaining 4 days or use vacation days, but since I frequently work late anyway, that doesn't bother me). Unfortunately, my wife doesn't have Fridays off, but I can usually con her into taking one or two throughout the summer, and I find ways to amuse myself for the rest. This year three of those Fridays will be consumed by honeymoon travel, which makes them extra exciting!